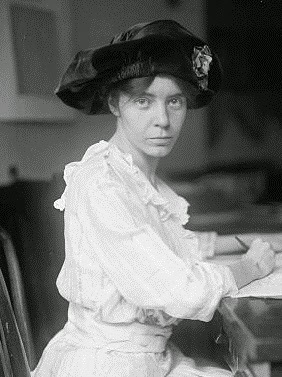 Alice Paul and Paulsdale: A Living Memorial ~ The History Girl! Often in history books and at historic sites, the story of women and their contributions is underrepresented or never mentioned. In recent years, more and more sites have included the story of women, African Americans, and other underrepresented minority groups into exhibits and programs. In Mount Laurel, New Jersey, the Alice Paul Institute defies the old trend, operating a historic homestead that serves as a living memorial to suffragist Alice Stokes Paul. But unlike most historic sites, it is not your typical house museum filled with Victorian furnishings and displays. Rather, it is a multi-purpose building that has been restored to its circa 1900 appearance, allowing for modern uses while also honoring the past. Paulsdale, the birthplace of suffragist Alice Stokes Paul, was built in 1800 by Benjamin Hooton in the Greek Revival style. It is a large, three-story, five-bay stucco over brick farmhouse. This farmhouse was one of three Hooton homes in the Moorestown/Mount Laurel area. The other two homes were "Hooton Hall" on South Church Street in Moorestown, and Sunnyside, built circa 1838 and located on Hooten Road off Church Street in Mount Laurel, about a half-mile from Paulsdale. Hooton Hall was demolished around 2001 and Sunnyside still stands. The original tract of land consisted of 173 acres. In addition to the main house, the property contained a banked barn for cows, a horse barn, chicken house and coops, stables, hog house, granary, carriage house, ice house, various sheds, and two outhouses. Of all the outbuildings, only the the dilapidated shell of the ice house remains. The remains of foundations from the cow barn and horse barn can be seen toward the rear of the property. 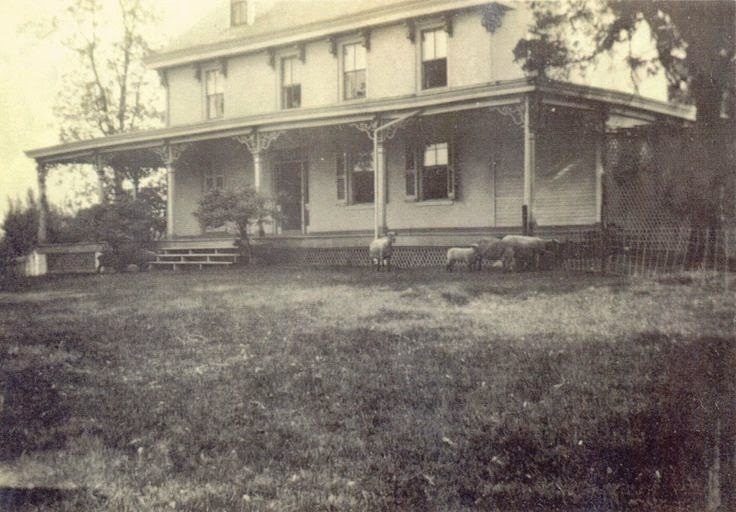 Alice’s mother and father moved into the farmhouse, which had been remodeled with Victorian style elements, in 1883. Alice was born January 11, 1885 to Quaker parents William and Tacie Paul. Alice had one sister, Helen, and two brothers, Parry and William, Jr. The Pauls were a progressive Quaker family, believing in equality, education for women, and constantly working to improve society. From a young age, Alice's mother took her to suffrage meetings. Alice attended the Moorestown Friends School and in 1905 graduated from Swarthmore College, a Quaker college founded by her grandfather, with a biology degree. She received a Master of Arts degree in sociology from the University of Pennsylvania in 1907. That same year, Alice moved to England to study social work at various British universities. In 1912, she received a Ph.D. in sociology from the University of Pennsylvania and by 1928, had earned three law degrees. Alice was always interested in achieving suffrage for women and utilized non-violent civil disobedience as a political strategy. In 1912, Alice joined the National American Women's Suffrage Association and was appointed Chairman of their Congressional Committee in Washington, DC. After months of fundraising and raising awareness for the cause, membership numbers went up and, in 1913, Alice and Lucy Burns formed the Congressional Union for Women Suffrage. Their focus was lobbying for a constitutional amendment to secure the right to vote for women. On March 3, 1913, the day before President-elect Woodrow Wilson’s inauguration, she organized almost 8,000 women in Washington, DC to march with banners and floats down Pennsylvania Avenue from the Capitol to the White House. In a time before social media, Alice utilized the power of the telephone. Paulsdale had a phone installed so she used the home as a base for her operations and as a retreat. After the parade in 1913, she organized large-scale demonstrations and picketed in front of the White House for eighteen months starting in January 1917. One year earlier, in 1916, she founded the National Woman's Party, which prioritized the passage of a constitutional amendment ensuring women's suffrage. The National Woman's Party's picketing eventually resulted in arrests in July 1917 for "obstructing traffic." Many, including Alice, were convicted and incarcerated. During her incarceration, Alice led a hunger strike that other women followed suit with. Alice was eventually sent to the jail's psychiatric ward and force-fed. However, the hunger strike caught the media's attention and continued to place increasing pressure on President Wilson and his administration. The center hall at Paulsdale, Mount Laurel, NJ. By 1918, President Wilson announced his support for suffrage but it took two more years for the 19th amendment to be approved. After the 19th Amendment passed in 1920, Paul and the National Women’s Party focused their attention on the Equal Rights Amendment. This amendment would guarantee women protection from discrimination. Alice worked the rest of her life advocating for this amendment, which still has yet to be passed. Among her other achievements, she initiated the inclusion of gender equality in the United Nations Charter. Between 1920 and 1958 Alice frequented Paulsdale. Aside from Paulsdale's Victorian alternations in 1883, not much had changed in the home through the first half of the twentieth century. In 1951, an addition was placed on the west end of the house on the foundation of the original summer kitchen, consisting of a kitchen, breakfast room, and porch. The home remained in the Paul Family until 1958 when it was sold after her brother William's death. Alice never married, committing herself to a life of causes. She returned to the United States in 1941 and lived with her sister Helen. After her sister's death in 1971, she lived with her friend and fellow activist Elsie Hill. Elsie died in the 1960s and Alice moved to the Alta Craig Nursing Home in Ridgefield, Connecticut. Alice later moved to the Greenleaf Extension Home in Moorestown, New Jersey. In 1974, she suffered a stroke that left her disabled. On July 9, 1977, Alice died of heart failure at the age of 92. Paulsdale, circa early 1900s. Image courtesy Alice Paul Institute. Paulsdale remained in private ownership from 1958 until 1990. At that time, the homeowners were in contact with the Alice Paul Centennial Foundation about purchasing the home and its six acres. The Alice Paul Centennial Foundation was established in 1984 to commemorate the centennial of Alice Paul’s 1885 birth. Still a relatively new organization, its members sprung into action to mount a national campaign to raise the capital needed to put a down payment on the property. In a short time, their goal was met and the home and property was purchased and saved from potential redevelopment and demolition. The site was placed on the New Jersey and National Register of Historic Places in 1988. In 1991, it was designated a National Historic Landmark. The Centennial Foundation, now renamed the Alice Paul Institute, undertook a massive restoration project to restore the interior and exterior to its circa 1900 appearance, the site's period of significance. However, their goal was not to open another house museum. The Institute wanted to use Paulsdale as their headquarters and facilitate the restoration of the building as a living memorial, serving a variety of purposes. This type of adaptive reuse was still a new concept in the early 1990s. The rooms, which maintained a high amount of historical integrity, were sensitively restored for modern uses and conveniences, while retaining the original floors, doors, fireplaces, moldings, and other structural elements. Today, the Alice Paul Institute furthers the legacy of Alice Paul and her life’s work for gender equality, and also takes a leadership role in bringing recognition to organizations and historic sites that honor women. In addition to the organization's mission, the site actively honors the history of Alice and the family farmstead, by offering tours and educational programming. In 2010, she was posthumously inducted into the New Jersey Hall of Fame. In fall 2015, permanent exhibit panels on Alice's life and work will be installed at the Alice Paul Institute.